Celebrate Nutrition Presents “Heart Healthy Popcorn” | Audio and video stories from Southwest Washington. Can popcorn be a nutritious snack, you might ask?! Absolutely! But not until you’ve had it Leanne style. Jazz up this otherwise butter and guilt-laden junk food with my creative modifications to enjoy one of my most favorite snacks. The secret ingredient to this recipe is nutritional yeast, a most delicious light and flaky cheese-like seasoning. Unlike baker’s yeast, which acts as a leavening agent to make bread rise, nutritional yeast is an inactive yeast and has no effect on individuals needing to avoid foods contributing to yeast infections. Stay tuned for a future video post featuring more nutritional insight and creative uses for this delightful ingredient. Optional: Seasonings of choice—cinnamon, pepper, rosemary or other herbs, salt-free seasonings, Japanese furikake seaweed seasoning. Using an air popper, such as Leanne’s favorite Presto Powerpop® Microwave Multi-popper, pop about 1/3 cup popcorn kernels. Your fluffy kernels will be ready in about 3 ½ minutes. Listen closely for the last few pops to prevent burning! Dump the popcorn into a large paper grocery bag. Season popcorn to taste with about 2 tbsp. olive oil, 2 tbsp. 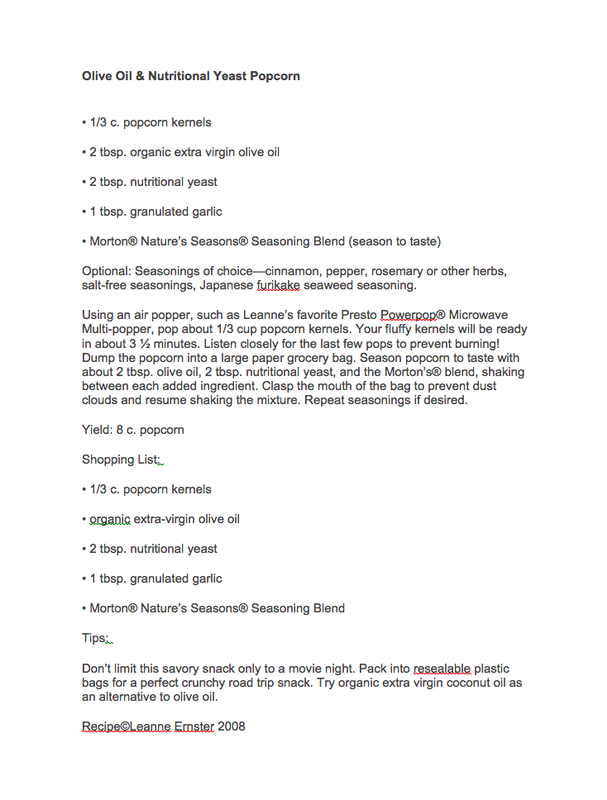 nutritional yeast, and the Morton’s® blend, shaking between each added ingredient. Clasp the mouth of the bag to prevent dust clouds and resume shaking the mixture. Repeat seasonings if desired. Don’t limit this savory snack only to a movie night. Pack into resealable plastic bags for a perfect crunchy road trip snack. Try organic extra virgin coconut oil as an alternative to olive oil. Download PDF of recipe and shopping list. Read more about Celebrate Nutrition's Leanne Ernster.